After making some rocker guards out of 3" x 4" angle iron I now found it necessary to modify these by adding more metal higher on the sides. I decided to use 3/16" diamond plate for protection and to reinforce the fiberglass tub in this area. I removed the angle iron and measured the area, then went to the metal shop and got two plates 8" x 50". Back at home I clamped one of the plates to the side, lining up the ends with the wheel wells and the bottom of the rocker panel (which has been cut and is now 2" higher then stock). Then marked the door opening from the inside and the angles on the top of the plate from the door to the wheel well openings. I could have left the top straight but I decided to cut it to save a little weight and I like the way it looks. Now for the fun part, cutting and grinding. I used a oxy/acetylene torch for the cutting and a 4" angle grinder to finish it off. It would be possible to use a few cut off wheels on a circular saw, this would made a cleaner frist cut. After the shapeing and welding it was clamped on again and mounting holes drilled throught the plate and body. I used 3/8" mounting bolts with very large washers on the inside. Now I feel confident that the fiberglass protected to the highest extent. 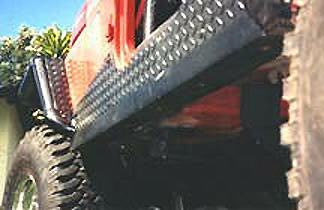 The angle iron used before was reused but on the opposite sides with the 4" part of the angle going under jeep. The angle iron is over lapping the diamond plate on the side and welded on the backside for a cleaner appearance and less bolt heads to hangup on rocks. If you wanted you could have the plates cut to 12" x 50" and have the metal shop roll a 4", 90 degee angle for the bottom, now that would be real trick!. 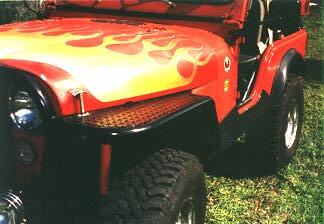 After the rockers were done I started looking for a way to better support the radiator rollbar. What I ended up doing was borrowing the idea from a CJ that I saw in a magazine, cutting the fenders and replacing them with tubing and steel. For mine I choose diamond plate to match the rockers. The tubing is from an newer CJ rollbar that I cut up. The next step is to open up the rear fender openings, the plan is to open them to a shape like the TJs. I'll remove the flares and use tubing like on the front and the gap between the body and the tubing will be fill in with diamond plate. The tubing will continue to the rear bumper with diamond plate wrapped corners to complete the protection around the entire Jeep.